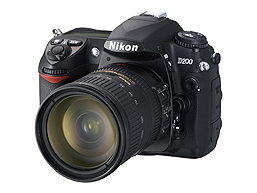 PC Magazine: Bottom Line: The D200’s speedy performance and unique features make it a powerful D-SLR worthy of an Editors’ Choice. Pros: New wireless flash system can fire the built-in strobe, great performance and picture quality. Cons: Expensive, price is body only without lens, heavy, some features are too complicated for beginners. Steve’s DigiCams concludes about Nikon D200 that with the release of the D200, Nikon have climbed to the top of the enthusiast dSLR market. With a host of features typically reserved for professional cameras, 10.2-megapixels of resolution and excellent image quality, Nikon has not only surpassed Canon in the enthusiast market, they have blurred the distinction with their own professional D2X. If the D200 were an entry-level dSLR, I’d complain about the softness of its JPEG images. But this is an enthusiast dSLR, and the need to apply a bit of USM in post processing is preferable to having an over-sharpened JPEG out of the camera. High ISO image noise can be an issue, but it is most pronounced when images are under exposed; proper exposures complemented by Nikons in-camera High ISO NR feature or post-processing noise reduction result in quite useable images at the highest sensitivity settings. It has been a long time coming, but patient Nikon loyalists have been rewarded with a new benchmark enthusiast dSLR; their patience may be tested more while waiting for their orders to be filled as Nikon struggles to keep up with the demand for this very fine camera. At an MSRP of $1700 it’s not inexpensive, but the D200’s features and image quality justify its price early in the product cycle.